Join us to kickoff Twin Cities Startup Week! We will celebrate our 4th Twin Cities Startup Week in style with great beer, great friends, and great music. Official Twin Cities Startup Week Fitness session. Check out local Fitness Startup Alchemy for a free class! Do you have an hour to kill between Startup Week events? Need a change of pace for the day, and want to work from somewhere new? Come snag a coffee or Redbull, and knock out some emails at one of our Free Co-Working locations! We are a brand new CoWorking space just west of Minneapolis. We are located in the former KQRS/Radio Disney Radio Station Building, we have transformed the space into a production studio-centered coworking space. With both podcasting as well as photo/video studios, we are an easy to access workspace for all types of entrepreneurs and content creators. Creating a recipe for high performance in your corporate life is significant, especially at a start-up. The same methods that enable world-class athletes to reach IPS (Ideal Performance State) are equally effective for business leaders—and perhaps even more important in our lives. Come hear about the top tips to make 2017 your fittest and most productive year yet. Also, join us for a free TCSW workout in our studio directly after the presentation. Change[Health] Pitch Competition is a live pitch cash prize competition aimed at showcasing products and services that impact local community health. Join Healthcare.mn and Impact Hub MSP, as we showcase notable, up and coming entrepreneurs, and startups ready to pitch their innovative ideas that are challenging and re-imagining the current healthcare system for the better. The top three pitches, as chosen by you, will walk away with cash in hand to bring their work from idea to action. Deadline to submit an application or nomination to participate is September 7. Finalists will compete for first, second, and third place prizes of $300, $200, and $100 provided by Healthcare.mn and Allina Health. Grab a coffee and cheer, as you hear from a selection of the best and brightest ideas reimagining the “care” of health in Minnesota. Be a part of the change and vote to ensure your favorite cause walks away with cash for care. Light breakfast and coffee will be provided by local MN startup, Eat for Equity, a social enterprise. Startup Lab is for entrepreneurial exploration. The Lab is a confidential learning space where you can explore your idea and begin to see the start of a business plan, consider your likelihood of success, and decide if entrepreneurship is right for you. Learn, explore, get clarity, and connect with others for feedback and support. You will also get a list of resources and contacts for further support if you choose to move forward. TCSW is filled with startups wanting to pitch their ideas, but how do you really know what a good idea is? What are the critical components of a great pitch? How do you apply pitch components internally within your corporation? This half–day session is an opportunity to both learn and pay it forward. First, you will learn from other corporate innovators how they structure their pitches to gain internal leadership support. Learn what to look and listen for, and critical questions your pitch should answer. Then, carry the momentum forward and provide your perspective, expertise, and participation with members of Rêve Academy, helping them evolve their business idea and prepare for a 7-minute on-stage pitch that will happen at end of session. The day will be in two parts in case you want to attend only one portion, notating your intentions when filling out evite. Private Event: Contact alisa@mulhair.com to request time slot. Are you Ready for Public Relations? When is it time to hire someone to do your PR for you instead of doing it yourself? What can you do to prepare yourself to outsource your PR? How do you spend your dollars wisely? How much time you should plan to spend on PR once you hire a firm?" The James J. Hill Center staff will review all the ways we can help you and your business grow. From start up to scale we have the resources, programs and networks to get you started and keep you going. Get the low down and find out which path is best for you. As an innovative entrepreneur or startup in the new economy how do you focus on utilizing your business to create positive impact? Join this lunch discussion, for an introduction to social business and explore the different ways that companies can cultivate positive impact in their work. The conversation, facilitated by Danielle Steer, Manager of Operations and Member Services at Impact Hub MSP, will share the advantages to social driven business and showcase the community of creative, passionate entrepreneurs who are actively working to make a difference to inspire and encourage the changemaker within. Meet the growing industry leaders that are utilizing the power of business and collaboration to advance social change. Features will include Software for Good, Peace Coffee, and more--all social enterprises that utilize a variety of ways to achieve social purpose. Dig deeper with the leading experts on what it takes to build a successful social enterprise. Light lunch will be provided by Eat for Equity, a social enterprise. Can Minnesota become an industry leader with emerging technology? Artificial Intelligence, Machine Learning, Virtual Reality and Autonomous Drones all have tremendous implications for the future of healthcare.Join us at Healthcare.mn for a casual chat with the some of the sharpest Minnesota minds working on these problems. We will have drinks and networking before and after this panel discussion. This year's Healthcare Track is genorously sponsored by Allina Health. About Worrell, Inc. Worrell is a global design firm that specializes in healthcare innovation and strategy. Since 1976, Worrell has served medical device and pharmaceutical companies with expertise in ethnographic research, human factors, and design and development programs. Working on the front lines with patients and healthcare professionals, Worrell uncovers unmet needs to bring new drug delivery, medical device, and digital health solutions to the market. Josh has nearly a decade of experience as a successful technology entrepreneur. He believes the future is AI and that coding, along with many other tasks, will be as arcane as punch cards. Allianz Life Ventures is hosting our first ever Innovation Day as part of Twin Cities Startup Week! Join us at our Minneapolis headquarters to hear from some of the top entrepreneurs in the industry about how their companies solve for unique challenges faced by consumers and businesses alike. A cocktail hour will follow. We hope you’ll join us for an afternoon devoted to fostering innovation! Hosted at Impact Hub MSP with Avisen Legal, P.A. Attitudes towards business have changed, with many for-profit companies pursuing objectives beyond just profit growth--looking to communicate their values through the unique B Corp Certification. If you’ve explored this option you know that this assessment sets a very high bar for companies and highlights the best of the best when it comes to social, environmental and economic impact. Join us for Part II of this social business series as Kim Lowe, Shareholder at Avisen Legal, and other experts in the field, dive deeper into the inner workings of B-Corps and Public Benefit Corporations, and the current legal status of PBC law in Minnesota. Come meet other interested companies and experts in the field, and together we will workshop ideas on how becoming a B-Corp can help advance your business goals, and where to start when you are ready to take the leap into this high profile option of social enterprise. Light snacks will be provided by Eat for Equity, a social enterprise. "How nonprofits can diversify their funding sources through business"
Hosted by Impact Hub MSP, Social Enterprise Alliance - TC and Avisen Legal, P.A. As the trends in philanthropy and grant funding changes for nonprofits, many are asking, "how can we legally generate revenue to support our programming?" Luckily, there are multiple activities nonprofits can leverage to generate revenue. See what income strategies are working among local non-profit scene and what revenue sources are available that align best with your mission. Whether you are thinking of starting a nonprofit or are looking to develop a new revenue generating income stream, get to know your options and possibilities with guidance from expert, Kim Lowe, Shareholder at Avisen Legal, and other nonprofit experts who have creatively utilized business strategy to elevate their ability to deliver more impact and strengthen mission. Hosted by SEA -TC + Kim Lowe of Avisen Legal, P.A. A seasoned panel of entrepreneurs, investors and lawyers will discuss the challenges and nuances of raising money for a Minnesota startup. Who should you talk to about investing – family, angels, VCs? Should you prepare a private placement memorandum? Should I present investors with a term sheet? What the heck is a SAFE? Should I sell convertible promissory notes? Kevin Spreng, Fredrikson & Byron P.A. David Winkler, Fredrikson & Byron P.A. Open Office Hours - Free Legal Council Avisen Legal, P.A. Open Office Hours – Free Legal Council from Avisen Legal, P.A. As an entrepreneur or startup, each week seems to bring on a new set of challenges, questions, and opportunities to learn something new. Impact Hub will host free open office hours throughout the week with experts from Avisen Legal, P.A. ready to answer your business questions and provide any personal guidance, resources, and trade secrets. Stop in to visit us throughout Twin Cities Startup Week to schedule your one-on-one conversation on a series of topics. While the topics are on rotation, any questions are open and welcome. The Impact Hub provides resources, inspiration, and collaboration opportunities to grow the positive impact of your work. Healthcare.mn wants to celebrate the community that makes it great. Join us for food, drinks and networking with some of the best and brightest around the Twin Cities. We also be making some big announcement for the year ahead. Join us to celebrate hundreds of Minnesota entrepreneurs who participated in a transformational journey that started in March including over 1300 entrepreneurs, three rounds of judging, numerous events and thousands of volunteer hours. The last 7 months have been an exciting ride and with great enthusiasm, we’re ready to recognize Minnesota's outstanding entrepreneurs. Night at the Mall is a kickoff event to get the participants together and introduce startup weekend. It will consist of ice breakers, networking, and an opportunity to meet the mentors for the week. 7:00 PM - 7:45 | WHAT'S YOUR PASSION? If you haven’t seen first-person-view (FPV) drone racing in action, here’s your chance to tip a few back at the Twin Cities’ hottest tap room and behold the sport of the future. We’ll start with an FPV freestyle demo outside in the Bauhaus courtyard (drones showing off) before moving inside, meeting a few top pilots (listed below), and then showcasing some action-packed micro-FPV drone racing through the Bauhaus tap room (may the fastest pilot win). And since FPV flying is made possible by small onboard video cameras with real-time transmitters, you’ll be able to ride along for every zoom, swoop, dive, roll and crash as Twin Cities startup Hydra FPV streams those camera feeds live to the giant Bauhaus projection screen. AirVūz - The world’s leading platform for discovering, watching, and sharing drone videos is based right here in Minneapolis, and they’ll be live streaming from this event AND giving away three (3) Horizon Hobby Ready-to-Fly Inductrix micro-FPV drone+goggle sets to a few lucky attendees/future pilots. Minnesota Autonomous Vehicle (MAV) Meetup - Known for attracting the coolest collection of drone pilots in town to monthly meetups, they’ll be setting up their FPV flight simulator for anyone to try. Hydra FPV - A new drone racing entertainment engine that enables dynamic live streaming of FPV flying action to Twitch, YouTube, Facebook, and more, turning today’s pilots into tomorrow’s sports stars. Bauhaus Brew Labs - A family of musicians, scientists, artists and – above all – beer lovers, aiming to reinvigorate the spirit of the family brewery. Bauhaus takes a unique look at classic German-inspired beer styles, skewed slightly by a sense of play and adventure. Female founders and women startup leaders will pitch their companies to Midwest investors and community supporters. There will be 18 women pitching! See Eventbrite link for more information and to sign up to attend! Official Twin Cities Startup Week Fitness session. Check out local Fitness Startup Fly Feet for a free class! Kimmy Scotti shares her insights as an entrepreneur and investor in health, wellness and fashion technology startups. Currently with 8VC, she seeks to invest in a wave of creative destruction that will promote greater innovation and global prosperity. Founding partner at 8VC and co-founder of the women’s health and wellness company Monthly Gift. Hungry for change? Start the morning meeting and hearing from organizations in the Twin Cities building businesses in the food industry to drive social change and job creation. Discover the deep rooted inequalities found in our current food system and meet the local startups who are committed to using food as a vehicle for social change. This panel and discussion will be moderated by Jeff Dykstra, Co-Founder/CEO Partners in Food Solutions, and feature Michelle Horovitz, Co-Founder/Executive Director, Appetite for Change, Marcus Owens, CEO/President of NEON, Tricia Nelson, Sales Development and Community Relations, FINNEGANS SBC, and Patsy Noble, Senior Program Director, of Urban Roots coming together to discuss the role of food and business in cultivating social justice. Together they will share the impact of their work, discuss the issues happening within our own community, and showcase how startups can play a critical role in continuing to drive this change. Find your place at the community table, as we come together to ask questions and bring about new ideas to solve one of the most important social justice issues of our time. Breakfast will provided by Breaking Bread cafe, a social enterprise, as well as feature products from each of the programs highlighted. If learning how to make more money is a skill you’ve been looking to acquire, please join us at 9 a.m. on the 2nd Tuesday of every month at COCO Downtown Minneapolis. The goal of this gathering is for attendees to authentically receive process design, tools used, and tips on what works to successfully grow revenue. This is a natural interview style format that will give you a peek into some of the top sales minds that took companies like When I Work, Fision, and Infor from good to great. Our desire is not only to create an inspired networking environment but also provide tangible knowledge that can be applied the second you walk out the door. This series for entrepreneurs, small businesses, intraprenuers, solopreneurs, nerds, creators, inventors & everyone in between! Attendees will learn how to use the James J. Hill Center databases to research private companies and nonprofits and to build tailored lists of grants and private market investors. Take a new approach to finding funding for your startup! If you’re looking for funding or information about specific private or nonprofit businesses, join us to learn how to utilize these library resources. The Department of Employment & Economic Development (DEED) offers start-up businesses assistance ranging from technical support to financing programs. Meet at an open house with representatives from the Offices of Small Business Assistance, Job Skills Partnership, Business Finance, Business Development, Small Business Development Centers, and the Minnesota Trade Office to learn about the many programs DEED offers that may help you with your business. The Inaugural Minneapolis Muster invites business leaders, innovators and military veterans to bring their best ideas and develop new connections and insights during this Twin Cities Startup Week Event. Bunker Labs is a national network of entrepreneurs founded by military veterans to help others start and grow businesses. The Muster Across America Tour 2017 will travel to 14 cities across the country to showcase entrepreneurs, empower local entrepreneurial ecosystems and serve as the launching point for Bunker Labs Minneapolis chapter activities. The Minneapolis Muster is all about connecting you with opportunity. If you are not a veteran you will gain the military entrepreneurial edge. If you are a veteran you will gain the network to quickly grow your venture. Either way we'd love for you to join us. America loses up to 40% of its food as it travels from farm to fork to landfill and entrepreneurs and innovators are tackling this problem from all angles. Come for lunch, discussion and a startup showcase highlighting three key themes of food waste: reduce, recover and reharvest. This discussion, facilitated by JoAnne Berkenkamp, Senior Advocate for NRDC will dive into how solving the problem of global food waste starts with local communities and involves integrated solutions throughout the entire supply chain. Startups and organizations participating include Reinvia, Sofi Taste Kineto, the Cleantech Open’s recently launched Food and Ag vertical, as well as the Agriculture Utilization Research Institute (AURI). Come hungry, as lunch will be made by local chefs, creating something delicious utilizing products normally thought of as food waste inspired by Dan Barber’s WastED. Intrigued? We know this lunch and conversation will spark possibilities, introduce you to new startups as well as change your perspective on 'waste' today. The Food and Ag track is led by Grow North, a resource and connection hub for food and agriculture entrepreneurs and the ecosystem. Grow North would like to thank the volunteers and organizations who helped make the entire track possible. This presentation will help startups and entrepreneurs understand IP assets as well as provide practical ways of thinking about, containing, and protecting their value, leveraging both self-help and professional services. 20% of your IP accounts for 80% of the total value of your IP. Join us for a fast paced, enthusiastic lunch and learn. Question: Will it be fun? Answer: You bet. Question: Are these companies legit? Answer: Heck yea, all are post seed with significant revenue and dozens of employees. These aren't just great ideas -- these folks are executing and at a high level. Question: Is there real money on the line? Answer: ...is there any other way of doing it? Question: Do you have beer Answer: Come on -- of course we do. Pitch Competition: A showcase competition where entrepreneurs compete for the top title and winner take all prize money of $5,000. All 3 companies have expereinced tremendous growth and success since inception and are actively raising post-seed or Series A rounds. Come cheer them on and be a part of the excitment. Three companies will be pitching their already succesful ventures during this event. *If you already registered for the Muster (https://minneapolismuster.eventbrite.com/) you don't need to register for a second time. This is only for people that will just be attending the pitch competition. Bunker Labs is a national network of entrepreneurs founded by military veterans to help other veterans start and grow businesses. The Muster Across America Tour 2017 will travel to 14 cities across the country to showcase veteran entrepreneurs, empower local entrepreneurial ecosystems with large-scale events, and serve as the launching point for Bunker Labs Minneapolis chapter activities. People today are looking for innovative food products that are organic, local, sustainable and made with authenticity. Yet bringing this to life can be a real struggle for food entrepreneurs as they build their supply chain as well as identify retail partners that will take a chance on them. A first of its kind Food Accelerator program launched in the Twin Cities, Maker to Market was created to address these challenges head on. This innovative program did not just offer personalized food business consult, from container shape to culinary support, but also elevated the commercialization process by pairing selected startups with local, small and disadvantaged farmers, subsidized their shared commercial kitchen production time, and guaranteed six months on shelf at Lakewinds Food Co-op's three Twin Cities area stores. Meet and hear from the leaders behind the Maker to Market Food Accelerator Program as well as the food startups that participated. This event will include a discussion on how the partnership came together, insights and lessons learned from their first cohort as well as a demo and product showcase from the food startups that participated. Program partners will also release details on the 2018 cohort including application release date and some new program offerings! Terry C. Sandvold, Founder and CEO of Sandvold Financial Group will share the successes and failures he's endured throughout 30 years of running his own business. He will also offer tips to entrepreneurs looking to build their financial portfolios. Join Flagship Bank for a beer and networking. Panel will discuss their experiences with their own start as well as tips on funding your own start-up. Snacks to be provided. As attitudes towards food and food production have changed dramatically over the last several years, the world has seen an explosion of innovators and entrepreneurs starting new food and agriculture businesses. Corporations have taken notice and developed internal teams and departments focused on investing in and partnering with startups at ever earlier stages. What does a partnership like this actually look like? How do the two companies work together? What does a large corporation look for in a startup and vice versa? This panel discussion will kick off the Food and Agriculture Track's 'Crash the Food and Ag Networks' networking Happy Hour. The event program will start promptly at 3:45pm. Too often, when developing a software product, startups are focused on the “champagne problem” at the end of the road. What entrepreneurs don’t think about are the roadblocks or diversions your team will encounter along the way. We will share five situations and five solutions that’ll help ensure there’s not one, but many, bubbly drinks in the future of your software. Talk is geared towards healthcare startups but all are welcome to attend! Gopher Angels have invited experts from various financing options to share their knowledge with entrepreneurs about how to finance their companies. The panel will include Jeff Robbins, attorney with Messerli & Kramer, sharing his knowledge about crowdfunding; Chris Styring from Venture Bank, covering the banks role in financing; Pat Dillon with SBIR on non-dilutive grant opportunities; Sara Russick with Capita3 on Venture Capital, and Dave Russick with Gopher Angels on angel funding. Managing Director, Gopher Angels. Entrepreneur and angel investor. The Social Lights invite you to join them at their HQ in Northeast Minneapolis for a night of networking, thought leadership, and problem solving. The event will highlight the agency’s top practices for social media success, hold roundtable discussions to answer questions on key industry topics, and educate attendees on how to leverage Instagram stories to grow their brand. Beer and snacks will be provided. Art promoters and investors get in FREE with proof of their background. Reserve your spot in advance and get a ticket for $5.99. $12 at the door! FORMAT of the event: Get 5 minutes of one-on-one time with an amazing person! When the bell rings, you rotate to the next table and meet your new friend. As the Twin Cities dance pop fix, she calls herself a "space siren" and follows through with futuristic lyrics and aesthetics. | She is a member of UAC (United Artist Collaborative) and credits them for where she is today. Join us at Fifth Element for a live recording of the Borrowed Interest Podcast hosted by three ad-women of color. They breach a range of topics, from finding a mentor to pro-bono with an irreverent, fresh approach. They're asking all the hard questions, like why do white people still touch their hair? Shareina is always writing something. Sometimes catchy headlines, occasionally she writes amusing emails, but she’s often writing about brunch (or thinking about it). When not writing, Shareina can be found contemplating the deeper meaning of thug life. Leeya’s career started where many careers begin: a Google search. A humble Google search led Leeya from artist to art director and to Minneapolis from her native Detroit. She’s also a faithful member of the Beyhive and an expert desk dancer. Amalia likes making things happen; either cool ads or kicking podcasts, Amalia has the spreadsheet to make it happen. She’s also been critically discussing the creative and cultural contribution of the movie White Chicks since 2004. I think like a VC but move like a founder. Startups and Entrepreneurship is my drug of choice. Are you a food entrepreneur, brewer, distiller, or next gen farmer? Do you work in CPG or ag? Do you work with, support, invest in the food and ag community? Then come on out and meet and mingle with your community! Minnesota is home to some incredible people working working in food, agriculture and beverage today and we want to bring these groups together to meet, network and connect with one another. The Food and Ag track is led by Grow North, a resource and connection hub for Minnesota's food and agriculture entrepreneurs and the ecosystem. Grow North would like to thank the volunteers and organizations who helped make the entire track possible. What problem is their startup trying to solve? Why did they form a startup? What made them want to do it? What advice do they have about recruiting a co-founder and key team members? Where did they get funding and what advice do they have? How did they develop customers and sustaining revenue? What are a few “lessons learned” they would offer aspiring edtech entrepreneurs? ECMC Group 111 Wash. Ave.
Beta.mn’s next Showcase event is gearing up to be the best yet. Come witness a dozen emerging Minnesota startup companies competing for the coveted "Golden iPod” trophy! Showcase is like a science fair for startups, with beer & music. There are no formal presentations, just local entrepreneurs demonstrating their products and services in an approachable, one-to-one setting. Attendees include founders, future employees, superfans, investors, friends, family members and anyone wanting to discover and celebrate local innovation. There's no set schedule; attendees are welcome to come and go throughout the evening. Premiere Night is a celebration of gener8tor's latest class of innovative startups and entrepreneurship. For the three months leading up to Premiere Night, gener8tor's group of entrepreneurs have been validating their business models, attracting customers and preparing their pitches. Premiere Night offers an amazing opportunity for gener8tor companies, entrepreneurs and investors to commingle. Each of gener8tor's Minnesota 2017 companies will give a five-minute pitch in front of a captive audience of investors, entrepreneurs and community members. Medical device development and accompanying regulatory environment and multi-sector resource connections. Official Twin Cities Startup Week Fitness session. Check out local Fitness Startup ALTR for a free class! Anyone interested can access the session via the below link provided. Protecting your tech-startup's most valuable assets--I.P. Do you know what intellectual property you have in your startup? Do you know why it is important to protect it? Join us for a breakfast conversation (delicious buffet included!) to learn how to protect your startups' I.P. Hear from our panel of experienced I.P. and startup lawyers from Fox Rothschild LLP. • Patents--Do you need a patent and what does it protect? • Trade Secrets--How do trade secrets work and why are they important? • Trademarks--Do you need to register your trademark to be protected? • Copyrights-- What type of assets do copyrights protect? • Confidentiality & Work-for-Hire Agreements--Why are they important? Fox Rothschild 222 South 9th St.
Join us for a panel discussion on the trials and triumphs of startup branding as we hear from visionary founders and leaders of some of Minnesota’s top tech companies. Learn how they’ve grown their business and brand story at every stage, be inspired by their scrappy and creative growth-hacks, and come away with actionable ideas to infuse your go-to-market programs. 1 Million Cups is a free, nationwide program designed to educate, engage and connect entrepreneurs. Founded on the notion that entrepreneurs can discover solutions and thrive when they collaborate with their peer network. Developed by the Kauffman Foundation, 1MC is a community of innovators and entrepreneurship enthusiasts who connect and support our local startups. Meet the founders from Brakfast.com, Gustola Granola, and Kindly Coffee who are changing the Food & Beverage landscape helping you to eat healthier, be more productive, and learn the ins and outs of what it takes to launch your own food company! CEO/Founder of Brakfast.com & Chapter Director at Startup Grind (Google for Entrepreneurs) St. Paul. 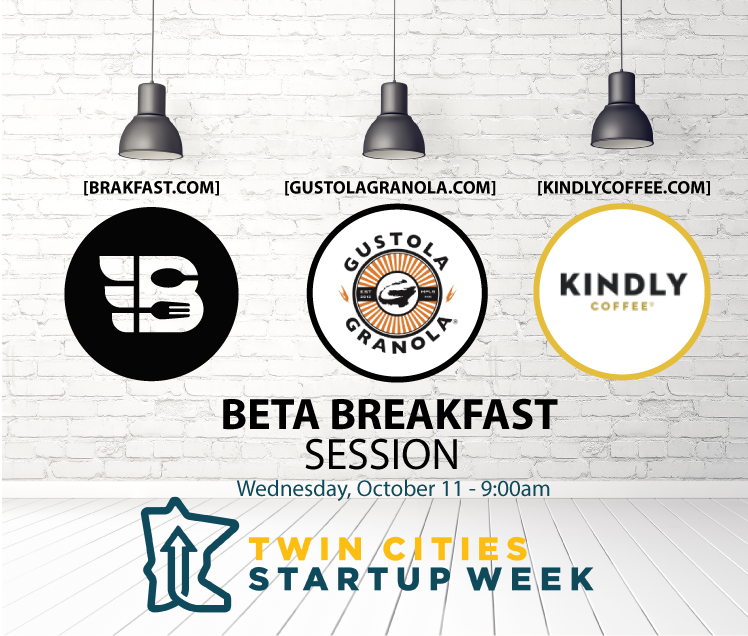 Thrilled to be a part of Twin Cities Startup Week, honored to share an event with Brakfast and Kindly coffee, happy to share some adventures in launching a food business, and excited to spread some Gustola Gustola love at breakfast! See you October 11! The challenge of feeding the world in new ways is an area of huge growth and opportunity within agriculture. How do we rethink using the land and utilize nature's resources in new and provocative ways? Minnesota's entrepreneurs are tackling these ideas head-on and exploring ways to extend the growing season, increase yields and drive sustainability. Join us for an inspiring panel featuring leaders in aqua and aeroponics as they talk about the changing world of agriculture, consumer preferences and the strategic partnerships that are enabling them to scale faster. Panelists include leadership from Urban Organics, Dave Augustine, CEO, Living Greens Farms, and Michael Ziebell, General Manager, trū Shrimp Systems. CEO and Co-Founder, Living Greens | | Living Greens Farm is bringing the vision of urban farming to economic reality. What traditional farms grow on 200 acres, Living Greens Farms can grow on one. It doesn't take you long in the startup community to find yourself in a conversation about it. That's right, growth hacking. "What are you testing to lower your CAC (customer acquisition cost)?" "What have you found that's worked for you to grow your ARR month over month (annual reoccurring revenue)?" "Oh you've got to try this thing we just did that got us a ton of new app downloads!" But there's one thing you need to make sure you have before you start working on any type of growth for your startup. Before you scaffold up a bunch of growth hacking tactics, you need the foundation for them to stand on. And that is a clear and compelling story. Without a clear and compelling story, odds are very good that any efforts to grow your startup will not succeed. The world gets noisier everyday and there is only so much attention that can be won by startups that already face an uphill battle when it comes to awareness and credibility. Join us for this workshop as Patrick Hodgdon, Minnesota native and co-founder of Story Sprints, will walk you through an exercise to tell your story in a powerful way: by only using 9 words. Join us at the Hill as we partner with members of SCORE, SBA, LegalCORPS and other specials guests for the opportunity to spend 10 minutes in a private one-on-one session with experts from the field. Come with questions and get answers. Our experts on the Hill will point you in the right direction, give you realistic advice and help you take your business to the next level. This is great opportunity for anyone and everyone thinking of or starting a business. Tips and feedback will include such important business topics as how to launch and grow your business, protect your assets, pitch your product or finance your next big idea. Investing in a Connected / IoT Product or Device is Different. Learn Why! Please register directly through Eventbrite. Capacity is limited in Sched. As companies create new products and serivces in this ever changing and connected world of "things", investors are a key pat of thie equation. However, what has worked in the past is not the model that will work in the futur when it comet building products that requires hardware, software and physical product design. As an investor, there's a different mindset that needs to be applied when working with startups in the this space. Come learn from local investor and entrepreneur, Kevin Nieuwsma who is CEO at GPSip Corporation & Independent Executive Advisor and has been working in this space on how to understand the phases of development, when investing makes (and doesn't make sense) and how gettingto a proof of concept is just a small step in taking a product like this to market! This event is for anyone in the public, but geared for investors, strartups or anyone at a company looking make their products or services more intelligent and connected. Drinks and light snacks provided courtesy of Lab 651 who connects the pyhsical world to the digital universe by making your products and devices smarter. This summer, 16 Macalester students took part in Mac Startups, a student-run entrepreneurship incubator. After identifying problems in the Twin Cities community (and beyond) they developed creative products to solve these problems. Their projects range from a Chinese character learning app, to an art incubator. On October 11th at 11:00am, the teams will be showcasing their work at a "Demo Day" event on Macalester's campus. Demo Day will feature short pitches from each of the Mac Startups teams, as well as a light lunch and networking. Food will be provided! Make sure to register so we can be sure to have enough food for everyone! Mac Startups is Macalester College's startup incubator. It was founded in May 2014 by Macalester '14 alum Petar Petrovic. The 2017 cohort includes 16 participants working together on 7 different ideas through an immersive 10-week summer program. CupBap (Bo Kim, Eun Shin and Hans Han) aims to provide an affordable fast-casual dining chain with a Korean street food called “cupbap”, literally translated as “cup of rice”. Cupbap is designed for the grab-and-go convenience and is easily customizable, catering to the customers’ dietary preferences. FUNL (Clinton Kunhardt, Garrett Goodstein) is a social media hookup app designed to interact with a users night life while offering and implementing safety features. JustConnect (Ben Lewis, Rachel Stromsta) is a platform that connects criminal record holders to employment opportunities and provide educational referrals and hiring opportunities for local businesses. Multimedia Art Collective (Juliette Myers, Zeam Porter) is a platform that connects Twin Cities artists to local communities and organizations through initiating collaborative and public art projects, workshops, and events. The goal is to create more opportunities for art and community involvement with an emphasis on social justice, artivism, and healing. Schedule Management (Hosea Ogeleka, Anzhe Cui) is an app that facilitates event organization and scheduling, capturing necessary information from a source (texts, image) to put into a calendar and support in-app messaging system. Tales of Characters (Eric Mok, Matthew Nguyen) is a learning app which breaks down Chinese characters into smaller components and re-unifies the components by both the historical meaning and the mnemonic stories. The character list includes the vocabularies from the HSK exam, the only standardized Chinese language exam in China, in order to provide HSK students a meaningful and interactive way in memorizing the Chinese characters. QuickCare (Daniel Neff, Isaac Siegel, Jake Hill) is a service that delivers all the necessary amenities and love to ensure a speedy recovery when you’re under the weather. CEO and co-founder of Kipsu, Chris Smith, along with speakers Brett Brohl (The Syndicate Fund) and Atif Siddiqi (CEO, Branch Messenger) will discuss the competitive advantages to building a tech company outside of Silicon Valley. The conversation will highlight how Kipsu, Branch Messenger, (and other local companies) have great success by taking a non-traditional, "anti-Silicon Valley" approach to scaling a SaaS business in the Twin Cities. This presentation will list the most important challenges and tips for successful business partnerships, pulling information from both successful and not failed relationships we have witnessed and been through. Suitable for folks who have partners, are seeking partners or who are just thinking about partners, we'll also touch on how to talk about the difficult things (money, time, etc.) with your partners NOW so you don't have issues LATER. Have you ever wondered where all of the food startups are making their products? Where are they sourcing ingredients? What does scaling a food business actually look like? There is a whole world of manufacturing happening in the Twin Cities built to enable food startups to grow and scale their ideas. We don't just want to tell you - we want to show you what's happening. Come and experience it first hand on a guided bus tour designed to give you an inside look. Your tour guide will be Jim Costello of Costello Solutions with surprise guests. Additional stops will also include the Local Food District Commercial Kitchen space in NE MSP and more to be announced. Not enough people know about your and your company. And they’re too busy to find out on their own. If more people knew about you and your business, you would have an easier time solving problems and making life better for everyone. You need to tell your story in a way that resonates, so that your audience understands and cares about what you do. We’re here to help with this seminar on Video and Visual Storytelling for Startups. The purpose of the event is to provide inspiration and instruction for using video and powerful visuals to tell your story. People move off of story. People remember stories. Everything you present is telling a story. You’ve got to shape your story to sell your company and your product. We’ll provide practical steps for anyone with any budget to tell a great story. Bryn Erickson is CEO of Realvision, a Minneapolis Tech Startup that uses the power of technology and visual storytelling to help realtors, builders and developers sell real estate. Realvision is funded and profitable. Looking to generate buzz for your brand? Influencer endorsements are a great way to expand your reach and help you achieve marketing goals effectively and affordably. This panel will teach you everything you need to know about working with the Twin Cities’ most influential influencers. Influencers are invited to attend to connect with Twin Cities startups and learn about potential partnerships. Experienced Vice President Creative Services with a demonstrated history of working in the public relations and communications industry. Skilled in Media Relations, Brand Management, Fundraising, Leadership, Executive Thought Leadership, and Influencer Marketing. Interested in learning how to leverage different technologies to support and grow your company’s business idea? We’ll focus on how 3 Minnesota startups, Field Nation, Total Expert, and Agosto, have leveraged bleeding edge technologies to solve a meaningful business need. Join us as we discuss the new technologies these startups chose, how they overcame obstacles or blockers along the way, and how the technology helped them solve their unique business problem. Agosto - Paul Lundberg, CTO at Agosto, will share how his team developed a proof of concept for a transit safety customer to solve a key scaling issue with their product offering by combining Computer Vision and Machine Learning. Agosto is an authorized Google Apps reseller, a Google Enterprise Solutions Provider, and a Google Premier Partner. Field Nation - Travis Emslander, CTO at Field Nation, will discuss why geolocation/mapping is a vital capability for Field Nation’s business, how his team leveraged an open source solution to meet that challenge, and the significant savings gained in lieu of leveraging Google Maps. Field Nation’s platform offers a web-based marketplace solution to connect businesses directly with contingent workers. Total Expert - Brian Walerius, CTO at Total Expert, will share how his team chose a front-end framework to match their business need. He will also discuss their considerations for using PHP, jQuery, and VueJS. Total Expert is a centralized platform to align your marketing, sales and compliance teams in one simple solution. Learn how to focus your time building the right products and features. We know how important talking to our customers is but sometimes we don’t know what to ask or how to do the user research. Collecting customer feedback means we have a ton of data all over the place that we don’t know what to do with. Even then, we still need to figure out how to use it to build the right products and features. Join us to discuss how to ask the right questions in your customer research, how to make sense of what you learn and use it to build amazing products and features that solve the right problems for your company and your customers. Please join us on the eve of the MedCity INVEST Twin Cities Conference to learn more about the local healthcare ecosystem and network with corporate and start-up executives, investors, and thought leaders. We will have several industry presenters and breakout networking sessions covering a wide range of digital health topics. Register here for the MedCity INVEST Conference on October 12th, 2017. Meet the Founders is an event for successful startups to share their stories. Attendees will have the opportunity to meet. Are you interested in impacting future female Technovators? Technovation is an international competition that enables middle school and high school (female) students to develop a business that leverages mobile applications to solve the problems they face in their communities. Throughout the process, the girls build many key skills including technical and business concepts, research, communication, leadership, presentation, etc. Mentors are a key component of the process, and can be of diverse backgrounds. Mentorship has proven to be a great growth opportunity for mentors, as well. Come mingle with previous mentors to learn first-hand what this experience is all about! Return to St. Kates--the scene of 2017 Twin Cities Startup Weekend Education and see the progress made by several of the teams. Also invited are teams from prior SWEDU events--plus other local edech startups. Reconnect with team members, mentors and judges! Format: Each team/startup will have 7 minutes to pitch and demo their app or product. The judges and audience will provide 5 minutes of feedback. Edji – Classroom web-based app to connect readers and teachers and improve reading skills. GogyUp – Personalized literacy app for adult emerging readers. InsertLearning – Chrome extension that lets teachers turn websites into interactive lesson plans. Cody Kitty – Training teachers with skills to comfortably bring robotics and coding to their classrooms. CowTipping Press – Writing classes for, and publisher of works by, people with developmental disabilities. Join us for Target + Techstars Retail Accelerator Demo Day in Minneapolis as our companies take the stage at First Avenue to present their businesses! We are proud to bring the members of Mobilize MN and attendees of Twin Cities Startup Week an incredible panel of mobile leaders representing some of the highest profile, largest mobile apps from companies in Minnesota. Official Twin Cities Startup Week Fitness session. Check out local Fitness Startup MInnesota Power Yoga for a free class! 1:1 Meetings. 15 minute slots. This isn’t your average conference! Learn from the best – this diverse group of innovators can teach you how to get your mind right, stay the course, and change the world. Our panelists play in large corporate environments, small companies, social enterprises, academia, government, non-profits, media and arts organizations. Confirmed innovation wizards are below and we are adding more every day. View a list of past panelists. Communities need innovation and innovation needs communities – but how do you line the two up to help and idea become a reality? This panel features women who are doing just that by inspiring and igniting their communities to get up and get moving, change attitudes on mental health, get their finances in order by using technology and supporting education in a whole new way. Innovation doesn’t happen in a vacuum – you need a culture to support the mission, and this panel examines how to create a culture of innovation. From smaller school districts to hospitals to massive scientific conglomerates, these panelists have shifted mindsets to create amazing results. 3:15 PM – 4:15 PM Panel 3: Go! You have the idea, you have community, you have the attitude, now get started! This panel will help you get started, from learning how to get funding to branding your idea to building up your project, business, or goals to maintain and sustain. Learn, grow, and then get out there and do! Build your small business skills and find support and inspiration with expert speakers, panels and workshops, exhibitors and more! Before you register, please complete the workshop interest form. Free event. Light lunch will be served. Come visit the Minneapolis office of Messerli & Kramer P.A. (located off the light rail stop at Nicollet & 5th Street and a 5 minute walk from CoCo Downtown Minneapolis) and learn from other startups and attorneys about the tasks you need to accomplish as you raise money for your startup. Attorneys Jeff Robbins, Draeke Weseman, Pam Curran, Dan Lowin, and Andy Tataryn will present and host a roundtable Q&A about preparing your startup for investment. Our goal with this Startup Week event is twofold: First, we want to create an opportunity for startups to meet other startups and discuss common issues and share experiences, and second, we want to provide general information from our experience serving startups that should help you save time, reduce stress, improve your likelihood of success, and reduce your costs when you raise money for your startup. Attorney, Messerl & Kramer P.A. Whether you are looking to start coding an application, building onto it, or scaling, technology is always changing. What works best for building something quick? What work best for scaling?. What languages work best for rapid prototyping, and what does scalable infrastructure look like these days? What technology do you use at different stages of building a company (10 users, 100 users, 10,000 users)? Open Source or proprietary? Build on IAAS or PAAS? Join us for a panel of folks who have built applications on a range of technologies at different stages of growth. Joe Stanton is the Director of Growth @ When I Work. Prior to When I Work he co-founded Elevate and held product leadership roles at Questar and OptumHealth. Are you thinking of starting a small business but do not know where to start? Do you have an idea, but need a few pointers on where the best resources are? If you answered yes to these questions or just want to learn more about getting a business off the ground in Minnesota, then this is the class for you. Did you know that by hiring outsourced experts to handle the 4 pillars of starting out (sales/marketing, HR, Finance & IT services) drops your risk of starting significantly? In the beginning, cash is king & our panel of experts is ready to answer your questions on how to limit risk by hiring the right services first. Please join us for an hour of content rich discussion on when and how to outsource, followed up by an authentic networking experience thanks to downtown Minne’s startup headquarters, COCO Downtown. Learn the basis of Unmanned Aircraft technology and how they relate to commercial operations. We will discuss capabilities and limitations, legal climate, and what to consider from a business standpoint when considtering UAS integration into an existing business model. A demonstration of various sUAS will be part of the event. MedCity INVEST Twin Cities was created as a satellite event to MedCity INVEST (held in Chicago), as an additional opportunity for healthcare investors and startups to network and connect throughout the year. At MedCity INVEST Twin Cities, you’ll hear from innovative investors, prominent industry players and the most promising digital health startups that are offering innovative approaches or trying to solve some of healthcare’s greatest challenges. Come meet Techstars Boulder Managing Director Natty Zola to get help with challenges facing your startup and/or to learn more about Techstars. Natty has invested in 34 companies in the past three years and as a former founder, turned investor, he can share some thoughts and advice to help you on your entrepreneurial journey. Full Stack Saint Paul is hosting its first-ever Saint Paul Startup Crawl on Thursday, October 12. Downtown startups will be rolling out the red carpet for locals and visitors who are interested in learning more about the Saint Paul startup scene. You will have the opportunity to visit businesses like Primordial Soup, Creed Interactive and Osborn370 – all in the same day! To learn more about the saint Paul Startup Crawl and register for the event, please click here. Meet the founders of several Twin Cities businesses who are making a positive impact through sales of apparel products. These entrepreneurs will share their tips for how best to weave a philanthropic mission into a brand in an authentic way. The Lowertown Booya is a St. Paul innovation zone - where new products are conceived, developed and protected and startups launch. MOJO Minnesota invites you to learn what daily life is like in the Booya from PSoup, Caztek, Grumbles Law, Nirin, and other local hosts. We are excited to participate in the St. Paul Startup Crawl. Creativity lives here daily. Check it out (and enjoy some refreshments and snacks). Costello Operations Solutions is pleased to host a forum supporting Food Entrepreneurs who are on the Co-Packing Journey. The discussion is especially suited for entrepreneurs looking to grow their company by hiring a co-packer. Should you go to a co-packer? How do you find a co-packer? What is a co-packer thinking when they are sitting across the table from you? How do you know what kind of care they are going to give your dream? Building and Maintaining a Relationship (counseling). What to include in an Agreement? We will present numerous case studies and best practices. This will be followed up by an extensive question and answer session. Please be prepared to ask a lot of questions! Marketing is one thing almost every start-up struggles with - how much do you need to do, what talent do you need to do it right, and what sort of resources should you be spending? We'll tackle those questions and more in this panel and q&a session. Our event will kick-off with a roundtable discussion with experts in the start-up marketing world. We'll talk about some big topics including the idea of minimum viable marketing and what role marketing (and marketing team members) play at different points in start-up growth. The second half of the event will feature our experts answering live questions from the audience. Come ready with marketing challenges and roadblocks you're currently facing, live answers will be provided by our panel and even some audience members. Hardware is Hard. No Really. It Is." Building a product that involves both the physicality of a finished product which includes both hardware and software is an order of magnitude more difficult of one that is pure software only. The barrier is coming down as certain supply and manufacturing channels are beginning to be figured out by startups, but it's not without and lot of trial and error. Lucky for us in the Twin Cities, we have a number of companies pioneering their physical products that involve hardware and embedded software and are willing to share their experience. Come join us as these individuals share their experiences in building products that involve working with suppliers, manufacturers and assembly processes that are halfway around the world. Interested in networking and talking about all things health care B2B SaaS? Founders from Perk Health, Chanl Health and ClinicianNexus will be available to talk and make connections to heat up the health care B2B SaaS discussion. Techquity is a convening that provides a unique platform for tech innovators and leaders to engage in dialogue and knowledge-building for the advancement of racial and gender equity in Minnesota’s tech sector. The events provides visibility for entrepreneurs from underrepresented backgrounds and united action toward growing the tech sector and the economy in an inclusive and sustainable way for future generations to come. This events leverages the interest and momentum from stakeholders surrounding diversity in the tech sector to build a holistic ecosystem based on a strong foundation of values, people, and investments. Techquity includes regional CEOs, VCs, executives, HR managers and senior leaders of tech companies, industry associations, along with government, educators, consultants and thought leaders committed to advancing this important conversation. We Meticulously Curated a Powerful Conversations and Connections. We provide Space for Networking and Mingling in a Fun and Radically Inclusive manner. PitchFest - three participating companies from the Showcase will have three minutes to present, then three minutes to answer questions from the judges. Zach Robins and Tim Joyce, co-authors of a forthcoming Mitchell Hamline Law Review Article on crowdfunding, will be analyzing data from over 400 federal crowdfunding offerings in order to reduce numbers into best practices. Come and join us at the Howe, just a couple blocks away and mere hours before MinneDemo! Is Twin Cities Startup Week blowing you away with all the amazing opportunity in the food sector? Come see what is next in this dynamic industry and celebrate the opening of the first phase of our new commercial kitchen community, 3100.3100 is designed to foster and accelerate the development of emerging brands by offering 24/7 access to their own custom kitchen space. 3100 not only provides the physical infrastructure so difficult for expanding food companies to obtain, but also offers the industry expertise and connections so critical for scalability and growth. Join us as we toast the innovative brands that will call this place home and showcase the gemstone of Minnesota’s food system, the Agricultural Utilization Research Institute (AURI). One of the novel ways AURI provides smaller producers the resources of larger brands is through its Sensory Panels, where AURI’s unique team of experts offers valuable input on new products during their development phase, increasing the chance of success in the marketplace.These fun, social events allow experts and the public alike to give real-time feedback around the taste, texture, and visual appeal of new products. See what’s on the horizon for Minnesota food and tell everyone that you tried it first at our house. Join us the evening of October 12th at 3100 for our showcase Smash the Senses sensory event featuring AURI - you’ll be glad you did. *Please use the complimentary valet service located at the front of the building and help us to be good neighbors, by not inadvertently overwhelming the street parking. How Do I Get My EdTech Startup Funded? Join us as 4 founders/CEOs of edtech startups will share their experiences with a variety of funding sources, including: angel investors, SBIR grants, corporate partners and bootstrapping. Entrepreneurship 101 is an event designed to prepare participants for the weekend ahead. The 2 hour event will provide a brief yet robust introduction to the entrepreneurial process. Topics covered will including: brainstorming, marketing, business model development, and more. The event will begin with Isabel and Caroline Bercaw, local teen entrepreneurs, followed by an activity in which groups of participants will quickly develop the backbone of a simulated company. For registration, see minnestar.org. Tickets will be scheduled in 3 releases. You need a ticket to get in! Minnedemo is a showcase for working technology products made in Minnesota. Demos are 7 minutes long and slides are NOT ALLOWED. We like to think of it as Geek Show and Tell! It’s an energizing and informative evening for innovators, investors, and technologists of all kinds. Come see what the local scene is up to, with networking before, during, and afterward. Join YPM for an Executive Coffee with Great Lakes Northern Outfitters' co-founders, David Burke and Spencer Barrett, onOctober 13th, 7-8AM, at Turtle Bread Company. You know and love Great Lakes' apparel for its Minnesota centric product and affinity for the lake life. Make sure to reserve your spot ASAP to not miss out on this opportunity to hear David and Spencer talk about their experience of founding a successful company in their early 20's! Official Twin Cities Startup Week Fitness session. Check out local Fitness Startup Twin Town Fitness for a free class! Join us on October 13th for Startup Week's Hackathon, presented by Nexosis. Participants will have the opportunity to work in small teams to ideate, design and present projects centered on creating solutions that provide positive social impact using the Nexosis API. The Winning team will receive $1000 to donate to a charity of their choice. In this session, we'll discuss fundamentals of value-based pricing to inform your pricing strategy and plan. We'll also introduce The Pricing Canvas (TM) - a useful pricing tool that can help align your product, offer, pricing, and cost structures. 2001-2009: Various insights as a research analyst and investment banker. 2010-present: Highly active in the entrepreneurial community. Work closely with a lot of financial technologies for Hill Capital Corporation’s formation. 2013-2016 Led Target’s Emerging Technology Function, 300+ startups across the enterprise. 2016-2017 Worked in a Venture creation collaboration with MIT, IDEO, Intel and Target 30 + new ventures and was COO for Illuminate (food Authentication and freshness solution). No one ever talks about it: the stress involved in starting/running a company or working in the tech industry. In this event, 3-4 founders will share their personal struggles with mental health. We will share tools & strategies to overcome specific mental health issues (depression, ocd, anxiety, bfrbs & more). We will also answer audience questions. The goal is to break down the stigma & help others on their journey to better manage mental health. Ticket pricing (TBD) will be donated to BFRB.org. Learn how a telehealth collaboration between two Minnesota companies and a company from Finland provide a digital mind-body-emotion solution for cancer survivors and predictive data analytics for healthcare organizations. We will share how to find and collaborate with partners to expand the reach of all involved and improve health outcomes for your end users. Often, founders just start businesses and get stuck in the weeds, they go off doing irrelevant things and come back to ask for funding with no real reasonable reason to give them funding. This talk will focus on the tactics a founder needs to adopt in order to be taken seriously within the startup world. People will take away at least 10 tactics they can employ from day one. Panel session featuring leaders from a range of local startups, offering advice on how to get connected with the right opportunity and what to expect about working for an early-stage company. Targeting students and individuals exploring career changes. We learn best by doing, but we can also learn from the mistakes of others. Taking a somewhat lighthearted look at some past mistakes by Minnesota companies, the presenters will talk about what happened and why and offer some tips on how your company can avoid the same fate. Everyone fails, it is how we react and start again that makes us great. The Entrance – Brick x Mortar has a secret back door entrance. We have attached a map for a visual. When you're close you can call/text me at: 515-720-9682(. I will come to the back door and let you in! Reporter Minneapolis St. Paul Business Journal. Curious about what makes Minnesota business tick. The event will be open to students and job seekers throughout the Twin Cities. Attendees can register for free here: https://z.umn.edu/TCSW17JobMarket. If you are a company interested in attending please reach out to Patrick Smith at pgsmith@umn.edu. The Startup Weekend Twin Cities Student Event is one of the highlights of Startup Week Youth. Participants will make teams around innovative ideas and build their entrepreneurial acumen through experienced mentors, pitch decks, inspiring speakers, and product development during the weekend. Eat food (Provided by SW Team), share ideas, practice pitches, get comfortable with fellow participants that you’ve met Monday and have known through the week. pitches that we recommend: Who are you and what is your background? Next, the crowd votes on their favorite pitches. This is simply a way to encourage quick team forming. From there we will form teams and these are the startup ideas that will be worked on over the weekend. Startup Weekend is an intense 54 hour experience, providing entrepreneurs a unique experience to create a company, product or service over the weekend. Individuals will pitch their ideas Friday night and form teams with other attendees. Wrapping up on Sunday, they’ll pitch their prototype app, website, product or service to a panel of startup judges. Startup Weekend Twin Cities was first held in 2010. Alumni who got their start at SWTC have generated millions in revenue, reached customers in every country in the world, raised millions of investor funding, surpassed Kickstarter goals, and have even been acquired. Those who attend should come with an idea, nothing more. Do not bring your existing startup to the event. Don’t have an idea for a new business? No problem! Come to join another team and experience the thrill of launching an idea into a real business. At the end of the weekend, some teams will continue and create a profitable business. Others will disband and walk away with tremendous learning. All should expect to make valuable connections with other entrepreneurs, experts and mentors who can help them in their future careers. Come prepared to write code, prototype product, design logos, develop a brand, prepare marketing, and plan revenue. This year, SWTC will be a combined event with two tracks, adult professionals and students. Check out the youth event here. Join us as week close out Twin Cities Startup Week with the biggest party of the week. We will be holding our first annual Startup Awards ceremony alongside GoKart Labs. We want to hear from you! Nominate your favorite Startups Today!